Ross Dawson is a leading scenario planning expert and advisor on long-term strategy with extensive experience in financial services, technology, professional services, media and other sectors. He works with top executives and project teams as a strategy leader and has deep expertise in facilitating strategic thinking among executive teams. Scenario planning recognizes that beyond a certain degree of uncertainty forecasting is of limited value (or can even be detrimental to good decisions). The process of creating a set of relevant, plausible, and complementary scenarios (more than the scenarios themselves) can be invaluable in creating and implementing effective, responsive strategies. The heart of the scenario planning process is distinguishing between Driving Forces (consistent long-term trends) and Critical Uncertainties (unpredictable elements). Once these are identified, they are brought together to create a set of scenarios that reflect both what you know and what you don’t know about how the environment will change. Ross Dawson’s Scenario Planning in Action Framework gives an overview of scenario planning, possible objectives, success factors and an outline of a generic scenario planning process. A large diversified financial institution engaged Ross Dawson and his team to execute a major strategy project to look at the bank’s business environment 7 years in the future. 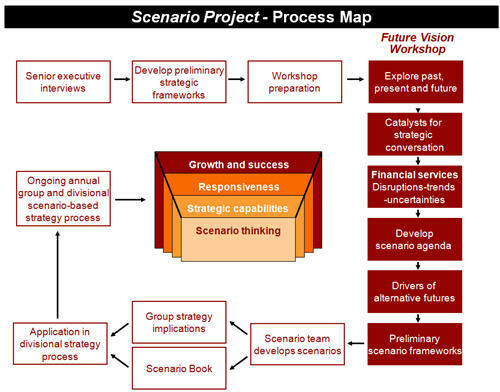 The image below shows a sanitized version of the scenario planning process Ross Dawson designed and ran for the bank . This was quite a streamlined process relative to a comprehensive scenario planning project, however was designed to bring the insights directly into the existing group and the divisional strategy process. The project’s outcomes helped shape the top executives’s view of the challenges and opportunities of a changing financial landscape and resulted in a number of important strategic initiatives, as well as driving better strategic thinking across top and middle management. Learn more about how you can transform the performance of your business with Ross’ world-leading expertise in strategy, scenario planning, technology, business networks and high-value relationships.